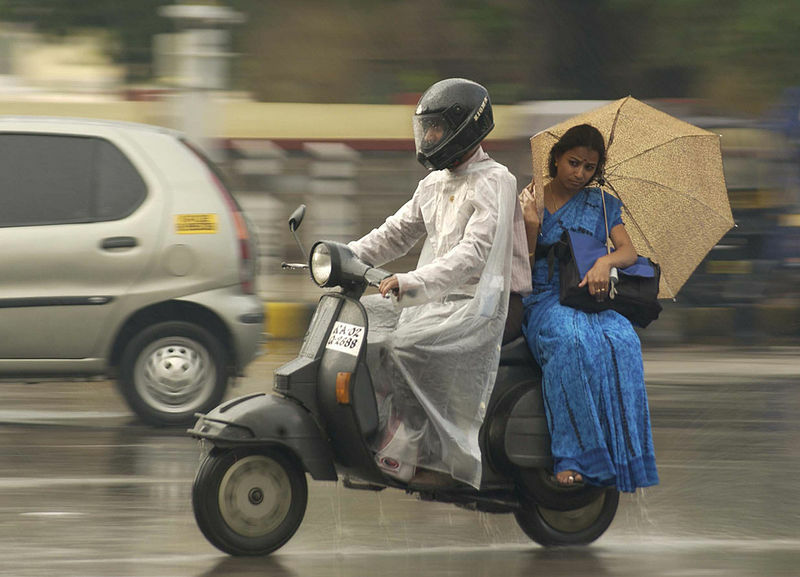 The India Meteorological Department (IMD) issued the much-awaited first stage of the Long Range Forecast (LRF) of 2016’s south-west monsoon on April 12. This came as a surprise to many as in the recent era, IMD has issued most of the LRF after April 20. The date of issuing of LRF used to be well-known in advance through news and IMD’s press releases but this time, it all happened in a jiffy. Although there have been some instances when IMD issued the forecast before April 20 (such as in the year 2004), they never issued any LRF before April 15 in recent years. No reason was stated for this "hurry" but a fact that can’t be overlooked is that this year, many private monsoon forecasters and firms have already issued their own monsoon forecasts. There was a sort of competition as to who would issue the forecast first. Hopes of a normal south-west monsoon rainfall this year had been there for a while but the forecast of "above normal" rainfall came as another surprise from IMD. They expect this year’s June-September rainfall to be 106 per cent (± 5 per cent) of 89 cm (which is India’s mean south-west monsoon rainfall). In terms of probabilities, there is 34 per cent probability that the rainfall will be 104-110 per cent of 89 cm, 30 per cent probability that it will be greater than 110 per cent or 96-104 per cent of 89 cm. There is 5 per cent probability of it being between 90 and 96 per cent of 89 cm and only 1 per cent probability of being less than 90 per cent of 89 cm. This year’s LRF happens to be the highest monsoon forecast (in terms of forecasted rainfall figure) IMD has issued in 17 years! In 1999, they had forecasted 108 per cent of the average rainfall. So, what must have led to a forecast of such a high figure? The ongoing El Niño in the equatorial Pacific Ocean is set to "die" in this year leading to a transition to neutral conditions. Spring is generally a season of transitions not only in terms of weather (like winter to summer) but also for phases of El Niño Southern Oscillation (ENSO) i.e. El Niño, La Niña and Neutral. A decaying El Niño can give way to neutral conditions which in turn can give way to La Niña conditions. In some cases, there have been a return of El Niño conditions like 1952-53, 1957-58 etc. As a result of these transitions, the models predicting El Niño or La Niña (i.e the ENSO) have limited skills during the spring and aren’t that reliable. This is famously known as the Spring Predictability Barrier. In India, we have more than 100 years of monsoon observations but ENSO-related observations are available mostly from 1950. Since 1950, there have been about 18 years or cases in which El Niño has transitioned to neutral or La Niña. For example, El Niño which started in 2009, ended in early 2010 and then gave way to neutral conditions followed by La Niña in the later part of 2010. In 12 out of 18 cases, monsoon rainfall has been above 100 per cent of 89 cm. Below is a list of these years in which recorded rainfall was more than 100 per cent. Note: figures in the brackets represent recorded rainfall in that year as per cent of normal. 1959 (114 per cent), 1964 (110 per cent), 1970 (112 per cent), 1973 (108 per cent), 1977 (104 per cent), 1978 (109 per cent), 1980 (104 per cent), 1983 (113 per cent), 1988 (119 per cent), 2003 (102 per cent), 2007 (106 per cent) and 2010 (102 per cent). But in 6 cases, it has been below 100 per cent : 1952 (93 per cent), 1966 (87 per cent), 1992 (92 per cent), 1995 (97 per cent), 1998 (99 per cent) and 2005 (99 per cent). Plus, India hasn’t seen any three consecutive years of drought. Thus, if one considers these factors and gives importance only to ENSO, a forecast of above 100 per cent rainfall can be easily given. Practically anyone can bet on a good monsoon using the undependable ENSO models. In fact, this is just the technique many private forecasters and firms have used to forecast this year's monsoon! Too much focus on ENSO? Since 1886, IMD has been issuing LRF for the monsoon and for operational purposes, and have been relying on statistical models. The monsoon is influenced by various atmospheric and oceanic factors at regional and global levels. All these factors influence the monsoon in their own styles. The first step in developing a statistical model is to find out such factors and also how much they have influenced the monsoon in the past. These factors are called as the parameters of the model. A mathematical equation is figured out thus establishing the relations between these parameters. If we know the values of these parameters (for example how warm the Pacific Ocean would be in the coming months) then we can get the answer of that equation which is the forecasted monsoon rainfall. The relation between these parameters and the monsoon rainfall keeps on changing over the years and hence IMD keeps on making changes in their model so as to maintain the accuracy. Between 1988 and 2002, IMD used the 16 parameter (such as temperature, pressure, snow cover etc.) method developed by Dr Vasant Gowarikar and his colleagues. In 2003, IMD made serious changes in this method by removing 10 out of 16 parameters and adding 4 new. This model was used to make a forecast till 2006 but in 2007, it was modified once again. Parameters and statistical techniques used in it were revised. But from 2007, the basic model has been the same (except for minor changes in 2014). The LRF which IMD issued on Tuesday, April 12 is supposed to be based on five parameters: 1) Difference in Sea Surface Temperature (SST) between North Atlantic and North Pacific Ocean 2) SST in equatorial South Indian Ocean 3) East Asia mean sea level pressure 4) Northwest Europe Land Surface Air Temperature 5) Equatorial Pacific Warm Water Volume (related to ENSO). But LRFs since 2007 talk only about the sea surface temperature conditions in the Pacific and Indian Oceans. LRFs always have this line—"As the sea surface temperature conditions over the Pacific and Indian Oceans particularly the ENSO conditions over the Pacific (El Nino or La Nina) are known to have strong influence on the Indian summer monsoon, IMD is carefully monitoring the sea surface conditions over the Pacific and the Indian oceans’. But what about the other parameters? The parameter such as East Asia pressure is known to have more correlation with the monsoon (correlation coefficient of 0.61 in 1983-2002). Expressing concerns over the increasing focus on ENSO in monsoon forecasting, Dr. Ranjan Kelkar, former Director General of IMD said, “It’s really odd to see the good old 16 parameter method coming down to just one i.e ENSO”. He further said, “It is improper to overlook the role of other parameters in any kind of long term monsoon forecasting”. Perhaps ENSO data is easily available and easy to understand. That’s why there has been a lot of focus on ENSO! Does 106 per cent rainfall guarantee an end of drought in India? 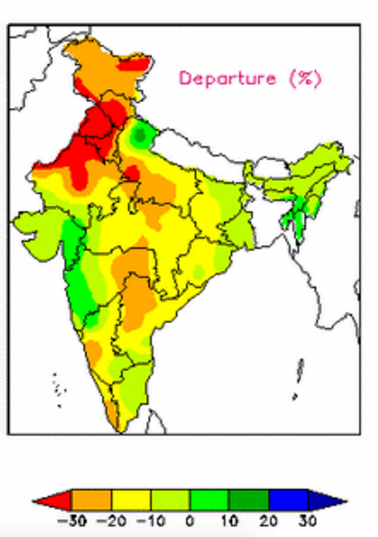 IMAGE: Rainfall anomaly during the south-west monsoon of 2004. Red colour indicates areas of poor rainfall. Certainly not! The environment in India has become a kind of "Hip hip hooray!!" after the announcement of this above normal monsoon forecast. The way this forecast is being carried in the news is as if all the states in India (including the drought-hit states) are surely going to get above normal rainfall. Some have even started predicting an end to drought in the whole of India because of this forecast. Large scale rainfall scenario in India will be good if it rains as per the forecast. The chances of filling up of major dams of the nation will be better this year as compared to last year. Chances of an increase in overall agricultural production too will be better this year and hence a good thing for the economy. But the figure of 106 per cent (which represents entire India’s average) doesn’t give any clear idea of how much it will rain on subdivisional or districts levels of India. An interesting aspect of the south-west monsoon is its variability on various scales. On an all-India level, the south-west monsoon is less variable (variation from mean is just 10 per cent) but on subdivisional or district levels, its variability is large. If we take a look at various LRFs the IMD has issued since 2003, then it becomes clear that inspite of normal or above normal monsoon forecasts, there have been cases of below normal rainfall in many parts of India. In April 2003, IMD forecasted rainfall of 96 per cent of 89 cm but parts of Kerala, Tamil Nadu, Marathwada and Karnataka got a rainfall anomaly of 10 to 30 per cent. In 2004 and 2007, they forecasted 100 per cent and 95 per cent of 89 cm respectively but North India got very poor rainfall. The same year, parts of Central India received a rainfall anomaly of 10 to 20 per cent. In 2013, they forecasted 98 per cent of 89 cm rainfall but Northeast India got very poor rainfall. The monsoon’s variability on monthly scales is also a mater of concern. Last year, Marathwada got normal rainfall in June, scanty rainfall in July, deficient rainfall in August but again normal rainfall in September. The net rainfall was however was deficient. Many states of India are witnessing drought. In many areas like Marathwada, Bundelkhand etc. it is no longer just a meteorological drought but a socio-economic drought. For drought to end completely i.e return of prosperity in the agriculture sector, sufficient recharging of ground water and return of socio-economic prosperity, all these places need excess and well-distributed rainfall not just this year but next year also. Proper techniques related to water harvesting, recycling of waste water and wise use of water will be important factors in determining how quickly the drought will end. There is no doubt that normal or above normal rainfall will mitigate the drought but as it has intensified so much, the forecasted rain might not be sufficient enough to end it completely. Thus, at this juncture, it will be important for farmers, the respective state governments and the Central government not to get carried away with the above normal monsoon forecast. There is a need to continue drought mitigation efforts and pragmatically plan things keeping in mind the climate and not just the monsoon forecast for that region. If we look at the history of El Nino and La Nina and Indian southwest monsoon rainfall, they present high variations. However, they present a system. Though the southern oscillation cycle [ENSO] vary between 3 to 7 years, there is a particular rhythm in which high [peak in temperature] El Nino follows the low [dip in temperature] La Nina then lean period [with little perturbations in temperature] varies between cycles. Same way, Indian southwest monsoon rainfall presents a below normal rainfall during El Nino year; followed by above normal rainfall during La Nina year; then follows the normal until the next cycle. In each cycle, based on the general circulation pattern, the peaks and dips in temperature in El Nino and La Nina years vary and accordingly the rainfall vary. So, along with the Southern Oscillation system the general circulation system around the three seas/oceans must be taken in to account as northeast monsoon and cyclonic activity changes the forecasts.